We use USPS Priority mail for all domestic orders. Free shipping for orders over $200. For International Orders we use regular Air Mail with USPS. You are responsible for any import duty on your order. HOW LONG SHOULD IT TAKE FOR MY ORDER TO GET TO ME? Domestic shipping is generally 5-7 business days, but can sometimes take 2-3 weeks depending on varying circumstances (stock, holidays, etc) . We do make every effort to get your order delivered as soon as possible. International shipping normally takes about 7-10 business days. However, it can in some cases take up to 1 month or more to reach you. I LIVE OUTSIDE THE U.S. AND ORDERED MY SHIRTS OVER A MONTH AGO, WHATS GOING ON? International orders tend to take longer to get to where they are going. Especially Canada and especially during the holiday season. There is no way for us to track orders outside of the US, so you will just have to be patient. If you order comes back to us for some reason, we will email you to let you know. YOU SENT ME THE WRONG SHIRT OR SIZE, NOW WHAT DO I DO? Just email support@allinhawaii.com and we will correct the mistake. We feel that if a mistake is made and it is our fault, it is not fair to ask you to go to extra trouble to send the item back. We would love it if you did, but it is not required. I ORDERED THE WRONG SIZE, OR I JUST DONT LIKE IT, NOW WHAT DO I DO? You can return your shirt for a full refund for up to 60 days after purchase date. Please include a note stating if you would like a refund OR what size you would like to exchange for. It is best that your note be written on the original invoice that was sent with your order, but if you have misplaced the invoice or thrown it out, then any old paper will do. EXCHANGES: We do require a $6.00 re-shipping fee. Please send $6.00 in cash OR a written note authorizing us to charge your credit card for that amount. If we do not recover a re-shipping fee from you we will not be sending a replacement. CAN I VIEW THE STATUS OF MY ORDERS? Yes you can do this at anytime. Simply click the "View Account" button located on the top of each page. Please note that in order for you to view your account you need to have created an account at the time of purchase. WHO DO I CONTACT WITH MY QUESTIONS, DO YOU HAVE A PHONE NUMBER? 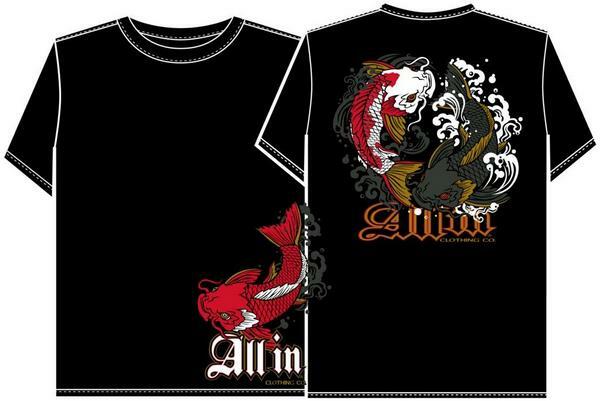 You may email your questions to support@allinhawaii.com anytime. You will receive a response within 24 hours. CAN YOU SEND VIA FEDEX OVERNIGHT SHIPPING? I THOUGHT I ORDERED A LARGE, BUT MY CONFIRMATION SAYS XLARGE, CAN YOU FIX THIS? When you first enter the shop, you are assigned a shopping cart that holds your purchases. Whenever you see an item that you want to purchase, you can add it to your cart by entering the number of items to add and clicking on the "Add To Cart" button for that item. You will then see the contents of your shopping cart, including the item(s) that you just added. At any time, you can view or change the contents of your cart by clicking on the "View Cart" link at the top of the page. You can remove items from your cart by simply setting the quantity to 0 and updating your cart or by clicking the remove icon identified by the trash can. When you have finished collecting items, you can click on the "Checkout" button located in the "View Cart" area, assuming that you are logged in. You will be given the chance to verify your purchase before proceeding to checkout. If you are not logged in you will need to either create an account, or login in order to use the shopping cart. Please note that it may take 2 - 3 weeks for your shipment to arrive from the order date. PLEASE be patient.